It is absolutely essential to thank everyone involved in the celebration of your wedding. Many people come together to rejoice in the pledge of two people in holy matrimony. Their material gifts and time commitment deserves your personal recognition. It is certainly appropriate to thank them in person, but it is also necessary to send a handwritten note of thanks. Do not simply send a pre-printed thank you note with only your signature! This conveys to the recipient that you either did not like the gift or did not appreciate the time and effort they spent choosing the gift. You may decide to have a portion of the thank you pre-printed, but you must add a personal note acknowledging the specific gift. It is a good idea, however, to have your address printed on the envelope to advise everyone of your new residence. You may order the thank you notes at the same time you order the Wedding Invitations. Handwritten thank you notes need not be lengthy. A mere few sentences can adequately express appreciation. The opening salutation (Dear Aunt Karen or Dear Mr. Smith, for example) should be the same level of formality and respect as you would address the individual in person. Then proceed to the “body” of the note. Once again, be sure to mention the gift when expressing your gratitude. It doesn’t matter if you liked the gift or received duplicate items. You may decide to acknowledge monetary gifts by mentioning how the funds will be utilized. The focus of the thank you note is not about the gift itself. 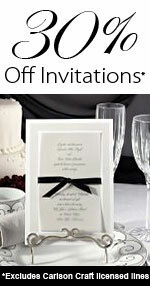 Instead, your correspondence is meant to honor the person who contributed to your happy occasion. Thank you so much for the lovely crystal vase. We absolutely love it. It will look beautiful on our dining room table, especially when Jim fills it with fresh flowers! We will cherish it always. Thank you for the china place setting you gave us. It is lovely and will complete our set. We will remember your thoughtfulness each time we use it. Thank you for the check you sent for our wedding. We plan to use it toward furniture in our new home. We hope to host a dinner party soon so you may enjoy it with us. We really appreciate your generosity and are thrilled you could celebrate our wedding day with us. Thank you for the toaster you gave us for our wedding. You are very thoughtful and we cherish our friendship with you. Thank you for being a part of our big day. If you receive a gift from a small group of people, such as eight to ten co-workers, it is best to send individual thank you notes. For larger groups, it is acceptable to send one note that may be circulated within the office or posted on a bulletin board. In this situation, be sure to extend a personal, verbal thank you to each person the next time you see them. Thank you notes for bridal showers should be sent within ten days. Ideally, wedding gifts received on the day of the ceremony should be acknowledged two to four weeks after returning from the honeymoon if one is taken immediately after the ceremony. In reality, this may take a bit longer, especially if the guest list was lengthy. If a wedding gift is received prior to the ceremony, a thank you note should be sent immediately so the giver can be assured it was received in a timely fashion. Do not send one thank you for two gifts. For example, if you receive a shower gift and later a wedding gift, each gift should receive a separate thank you note.